Have you got a necklace pendant that you never wear because it isn't the right colour for you? 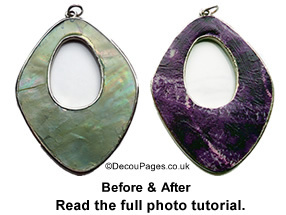 It is quite simple to decopatch many different pieces of jewellery. Transform them into something unique that goes with the colours you tend to wear. Making out a rough paper cut-out is a useful trick. Simply draw around the object and cut out the shape leaving an outline stencil. In this case it needed a 2 part cut-out to lay on top of the Decopatch paper. It will help you to choose the right Decopatch paper. 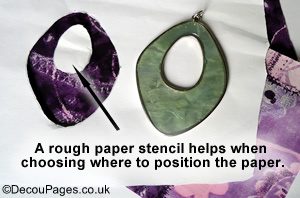 It's also really helpful when it comes to deciding how to position the Decopatch paper. When you've made up your mind, lay the pendant on the Decopatch paper and carefully draw around it. Carefully cut the shape out. Lay it on top of the pendant and trim as required. 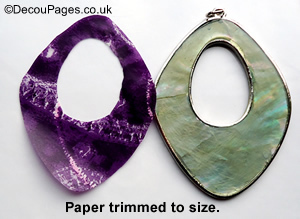 In this case the paper needed to be slightly smaller than the pendant so the silver edging would be visible. Using fine sandpaper, slightly roughen the surface of the pendant.This will help the decopatch paper to stick better. Make sure the surface is clean and free of dust by wiping with a slightly damp cloth. Coat the surface of the pendant with a thin layer of Paperpatch glue-varnish and carefully position the Decopatch paper. Lightly brush another coat of Paperpatch glue-varnish over the top, carefully smoothing out wrinkles or bubbles. While still wet, use a damp cloth to wipe any excess glue-varnish off the edges. When dry, coat with a layer of AquaPro varnish. Again wipe off any excess from the metal with a damp cloth. 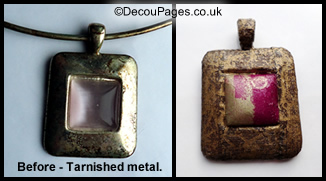 This tarnished metal and resin pendant was too tarnished to wear. It gained a new lease of life with Decopatching. The metal area was covered with overlapping strips of Decopatch paper. The ring at the top was covered with several very small pieces of paper. A small hogs hair brush was needed to work the paper into the crevices. The centre of the pendant was covered with a single, carefully trimmed piece of Decopatch paper. A large blob of Blu-Tack is helpful to hold small items such as pendants above the work surface while wrapping the Decopatch paper around the edges.